Two players of champion Olympiacos, and one from Panathinaikos, Aris and AEK, compile the All-Greek Basket League team of the 2015/2016 season. 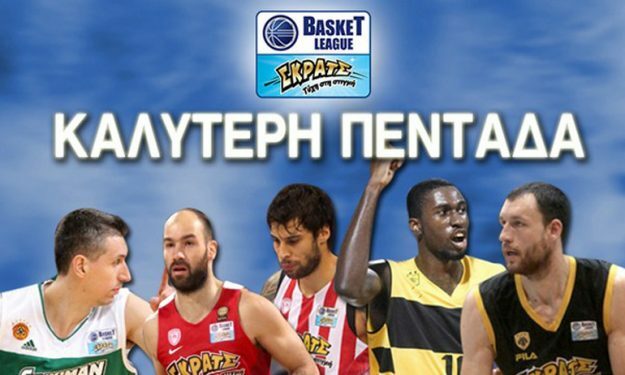 Two players of champion Olympiacos, and one from Panathinaikos, AEK and Aris, compile the All-Greek Basket League team of the 2015/2016 season. Vassilis Spanoulis (Olympiacos), Dimitris Diamantidis (Panathinaikos), Okaro White (Aris), Giorgos Printezis (Olympiacos) and Loukas Mavrokefalidis (AEK) were the players chosen according to a voting in which the head coaches and team captains of the 14 league clubs participated, along with Media and fans. Being also named MVP of the league, Vassilis Spanoulis averaged 13.1 points and 5.4 assists, in the season, ultimately leading Olympiacos to the title with a series of spectacular performances. In the last season of his career, Dimitris Diamantidis scored 9.3 points, dished 4 assists and grabbed 2.9 rebounds per game for Panathinaikos, providing once again a multifaceted impact on the game. Okaro White was recognized as one of the most impressive foreign players in the league, after finishing his debut season in the league averaging 13.9 points and 7.3 rebounds. The co-captain of Olympiacos, Giorgos Printezis was once again dominant at the low post, and not only, scoring 9.3 points and grabbing 4.5 rebounds per game. As for Loukas Mavrokefalidis, he had a very potent season as it is obvious by the 13.9 points, 6.4 rebounds and 2 assists he averaged for AEK BC, as the Athenian team won third place in the league.